Pneumatic pressure rollers allow you to laminate certain substrates up to 50% quicker, saving both time and cost. The Matrix can be purchased as a complete system, or as a modular retrofit for the multilingual MX-530. The Pneumatic option is produced in Britain which shortens our supply chains and lead times. Weâve used the highest quality components within the systems, including Omron switches, Schneider electrics and British built Bambi compressors. The Matrix MX 530P gives you the ability to bring high performance lamination in-house means you can avoid costly set-up charges. Matrix offers you the ideal investment in finishing your digital print work - on demand - for brochures, menus, business cards etc. Films in a gloss or matt finish catering for large 1000m roll drastically reducing the cost per laminate. "The pneumatic system produces more pressure giving faster lamination and a stronger bond"
Optional foiling and spot UV style addon now available for pneumatic model only. Similar to traditional foiling methods, the process to create these on-demand effects works by using heat transfer technology, but at a fraction of the cost of producing individual dies for each job. Systems that add these special effects during the finishing process give prints that extra 'wow' factor. These finishes are typically used on packaging, business cards, stationery, book covers, security print, wedding stationery and high end bespoke print. Using this system there is no pressure denting to stock as with the traditional block foiling method. 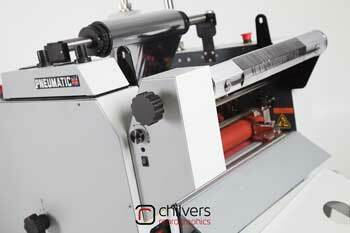 LOOKING FOR LAMINATING ROLL / FILM / FOIL? Click Here.